Viols were bowed instruments ranging from treble to bass, but by about 1780 they had been superceded by the violin and cello. However, this bass viol belonged to John Cawse (1779-1862), one of the earliest pioneers in the revival of Early Music. The body may have been made by Joachim Tielke (1641-1719), but the neck, fingerboard and tailpiece date from the mid 1720s. Cawse lent his instrument to be played in the Concert of Ancient Music at Windsor Castle, an event organized by Prince Albert (1819-1861) in 1845 and perhaps the first of its kind. Despite what was then a highly unusual enthusiasm, Prince Albert felt compelled to make economies in the Royal Household and abolish the obsolete post of Royal Lutenist at about this time. Belly of two pieces of pine, with an oval rose of ivory pierced and carved with a figure playing the harp. Back of rosewood, slightly arched, with ivory lines and ornamental motifs in the Tielke manner, as also the sides. Wooden side linings. Tailpiece, attached to an ivory and ebony hook-bar, and fingerboard both with marquetry of ivory and tortoiseshell with grotesques; small sections of mother-of-pearl may replace pieces of semi-precious stones. The pegbox, with marquetry similar to the fingerboard, is surmounted by an unusual scroll. The six original pegs are replaced by brass whole-plate machines by Baker, London (early nineteenth century), with ivory pins and buttons. The neck is tied with thirteen gut frets- nearly twice the usual number for a viol. "One of the problems with ivory when used on much larger scale, such as a plaque, is that as the glue holding it in position dries out, this decorative feature can start to curl. A plaque, 41/2" x 3" x 1/8", on the Bass Viol by Joachim Tielke of c. 1700 (168-1882) had produced this problem. This is a fine example of a bass viol, with ribs and back of rosewood inlaid with ebony and ivory, and the belly made of pine. The difficulty is that ivory is brittle and does split if forcibly flattened. Thus, it needs to be softened on the reverse side with a mixture of ether and hydrogen peroxide which enables the ivory to relax. A special clamp was devised, which was used after the ivory plaque had been re-glued into position. This clamp carefully encircled the sideways-placed bass viol without damage, enabling the special screws incorporated in the clamp to hold down the plaque whilst the adhesive set." 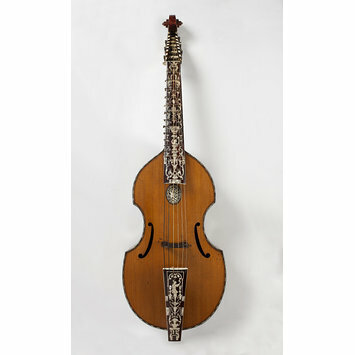 London, Victoria & Albert Museum: Catalogue of Musical Instruments in the Victoria & Albert Museum. Part II, Anthony Baines: Non-keyboard instruments (London, 1998), pp.6 - 7. 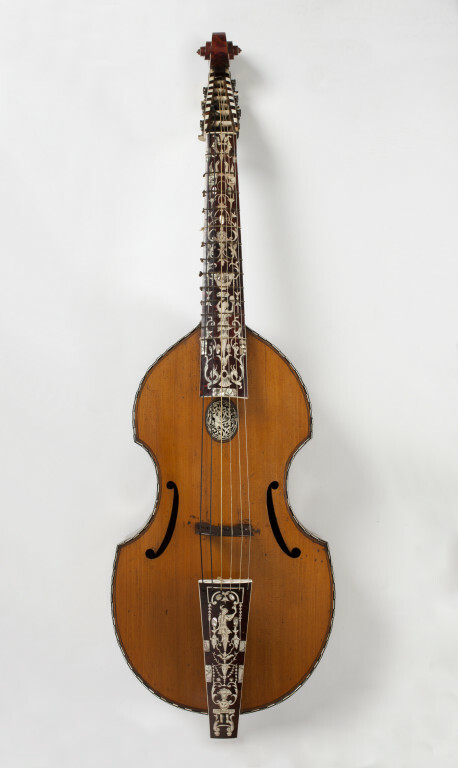 In the opinion of Günther Hellwig, editor of the exhibition catalogue Ein Hamburger Lauten- und Violenmacher der Barockzeit (Hamburg, 1980), the body could be by Joachim Tielke (1641 - 1719) but the neck, fingerboard and tailpiece date from the mid 1720s.